I’ve lost my CyberGrants login information. How do I retrieve my username and password? Can I just create a new account? We prefer that you do not create a new account, but rather continue to use the same login you have used to apply in years past. This will keep your funding history in one place, which will help us to more quickly and effectively review and process your proposals. To retrieve your username and password, please email our CyberGrants support team at cgsupport@cybergrants.com. I’m having difficulty logging back in to CyberGrants. Will I be able to finish my application? Occasionally, grantees will get kicked out of the CyberGrants system while submitting an application, so we highly recommend saving your application as you are working on it. If you get kicked out of CyberGrants and cannot log back in or are continuously logged out, please email our CyberGrants support team at cgsupport@cybergrants.com. They will be able to advise on any technical issues and help you log back in to finish your application. If you are submitting your application on the final day of a grants program deadline and cannot log in to CyberGrants, please email our Patagonia Grants Team at grants@patagonia.com to let them know you are having technical difficulties with CyberGrants. This will help you to avoid missing a deadline. We successfully submitted our North American grant proposal but haven’t heard back in more than 6 months. When will we find out if our grant was approved? All grant proposals that are successfully submitted to the appropriate program are reviewed by our grants councils within six months of grant proposal deadlines. If it has been more than 6 months since you submitted your proposal and you have not received communications from Patagonia, either via mail or email, please reach out to our Patagonia Grants Team at grants@patagonia.com. In this scenario, it is often the case that a grants decision letter was lost in the mail, so please log in to CyberGrants to confirm that your mailing address is correct before reaching out to our grants team. *Please note that if you submitted your application outside our grant proposal deadlines, we may have moved your proposal to our next round of grants, in which case, it may take more than 6 months for us to review your proposal. Please refer to the guidelines for the grants program to which you applied for deadlines and expected response times. We successfully submitted our International Grant proposal but haven’t heard back in more than 6 months. When will we find out if our grant was approved? If you applied through one of our International Grants Programs, it can take up to 6 additional weeks for funds to be distributed to organizations outside the United States. Please expect to receive notification of our grant-making decision from Tides, our donor advised fund, within 7 months of your program’s deadline. Because some of our international programs only have one proposal deadline in a given year, if you submit an application outside this deadline, it may be up to 10 months before you find out if your grant was approved. For international grants deadlines, please refer to the International Grants Program page or the Patagonia Grants Program website specific to the country in which your project is located. 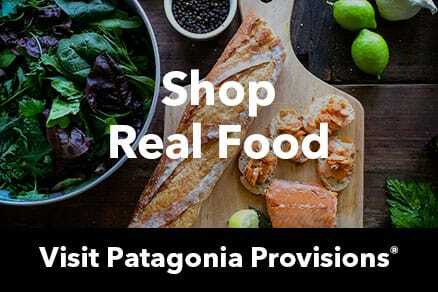 You may access another country’s Patagonia website by clicking on the country flag located in the bottom left corner of this site and selecting the appropriate country. My organization’s grant was rejected, and I’d like to request feedback so I can improve our proposal for next time. Who should I talk to so I can better understand why our grant was not approved? For feedback on how you can improve your proposal for the next fiscal year’s application, please reach out to the Patagonia Grants Team at grants@patagonia.com. How often is my organization eligible to apply for a grant? If our grant is rejected, when is our organization eligible to apply again? All organizations are eligible to apply for a Patagonia grant once in a 12-month period. This policy is applicable both if your proposal is approved or if your proposal is rejected. For example, if your organization submits a proposal on August 20, 2017, for our August Corporate Program deadline and your grant is not approved, you may apply again in August 2018. Please log in to CyberGrants to see when you last applied for a Patagonia grant. Our organization has multiple important projects this year, each of which fits within a different Patagonia Grants Program. Can we submit separate applications for each project to each of the appropriate grants programs? We can only accept one proposal per group per our fiscal year (May 1–April 30), across all Patagonia grants programs. You may not submit more than one proposal in a 12-month period, even if separate applications are submitted to different Patagonia grants programs. For example, if you have just submitted a Corporate Grants proposal for one project and have another important project that would be a great fit for our World Trout Grants Program, you must wait until the next fiscal year to apply for the World Trout Grant. The person that submitted our grant proposal is no longer the appropriate contact person (they’ve left the organization, there’s a new person in that role, etc.). How do we change our contact information so we don’t miss any important communications regarding our grant? The email address entered, under the proposal’s Primary Contact, when your organization applied is the email address that will receive ALL grants-related communications related to that proposal, including funding decisions, requests for a revised proposal, progress reports, etc. If that person is no longer the appropriate contact for grants communications, for whatever reason, please reach out to our CyberGrants support team at cgsupport@cybergrants.com to revise the contact information for your organization and any affected proposals. Our organization has moved locations since we applied for our grant. How do we update our mailing address so we don’t miss any important communications about our grant? All of our grant award letters and checks are distributed via mail, so it is critical that your mailing address is up to date in CyberGrants. Without an updated mailing address, notification of your grant approval/rejection will be sent to the organization address listed in your CyberGrants account. If you have moved or your desired mailing address has changed for any reason, please email our CyberGrants support team at cgsupport@cybergrants.com to update the necessary information. I got an email request for a check acknowledgement letter, but never received a check. Does this mean our grant was approved? Is our check in the mail? Yes, if you received an email request for a check acknowledgement letter, your grant was approved. Congratulations! Unfortunately, if you have not yet received your grant award letter and check, that most likely means that your check was mailed to the incorrect address. Log in to CyberGrants to verify that the organization address listed in your organization’s CyberGrants account is correct and up to date. This is the address to which we sent your check, and may be different from the payee address you supplied in your application, so please confirm that your organization address is the appropriate address for receiving your check. If you find that your organization address is incorrect and needs to be updated in CyberGrants, please email our CyberGrants support team at cgsupport@cybergrants.com to update the necessary information, and then email our Patagonia Grants Team at grants@patagonia.com to inform us of the recent change. We will then be able to cancel your check and reissue a new check to the correct address. If you find that your organization address is correct and you still have not received your grant award letter and check at this address, please reach out to our Patagonia Grants Team at grants@patagonia.com so we can identify the issue. *It is a rare occurrence for checks to be mailed to a fiscal sponsor, but if you do have a fiscal sponsor, we also recommend checking with them to see if they received the check. My grant letter indicated that I would receive an email to submit a check acknowledgement letter, but I haven’t received that. When is that due? If you receive a Patagonia grant, you will be required to submit a letter acknowledging that you received your check (to be used for our tax purposes). Around the same time that you receive your check, the primary contact listed in your application should receive an automated email with instructions to upload a check acknowledgement letter, which will be due within one month of the date you receive the email. If you don't receive this automated email within 2-3 weeks after receiving your check, please log in to CyberGrants to confirm that the contact information you listed in your application is accurate and reflects the person from your organization that should be receiving communications regarding your grant. If the contact information is correct, but you have still have not received the automated email, please reach out to CyberGrants support at cgsupport@cybergrants.com to upload the grant acknowledgement letter. Please note that without Patagonia's receipt of this letter, you will be ineligible to apply for another grant. Does Patagonia require progress reports or project updates? When are progress reports due? If you receive a grant from Patagonia, you will be required to submit a 9-month progress report. The report will become available approximately 8 months after you receive your check. At this time, you should receive an automated email with instructions and a link to answer a few questions about how your work has progressed. Please complete this progress report by the deadline listed in the email, which should be approximately 9 months after you receive your grant check. If you have not received an automated email about progress reports within 8-10 months after receiving grant funds, please reach out to our CyberGrants support team at cgsupport@cybergrants.com. We have made some revisions to the campaign that Patagonia funded. Does that affect the grant we received? Can we continue to use the funds for our new campaign? If you have made minor revisions to a campaign project Patagonia funded and the intended use of funds is consistent with the proposal we approved, you do not need to notify our grants team. For any major updates to a campaign we have funded, please reach out to the Patagonia Grants Team at grants@patagonia.com. Our funding needs have shifted due to _________ (political decision, campaign victory, etc.). Can we just use the Patagonia grant for general program funding? Because our grants councils involve many employees that carefully consider proposals on a project-by-project basis, we do not make grants for general program funding and prefer that grant funds be used for only project-specific purposes. If you have already received a Patagonia grant and your funding needs have shifted in the middle of your funding cycle, please reach out to the Patagonia Grants Team at grants@patagonia.com. Someone on our team will get back to you within one week to develop an effective strategy for redistributing Patagonia grant funds. If you have not yet received a grant decision letter and your funding needs have shifted since you submitted your proposal, we ask that you update your proposal to reflect your new funding priorities so we can take this into consideration when reviewing your grant proposal. Please do not simply submit a new application. Instead, reach out to our Patagonia Grants Team at grants@patagonia.com so we can send you a proposal resubmit request in CyberGrants, which will allow you to update your existing grants proposal. We just had/have a major campaign __________ (victory, loss, moment coming up, etc. ), and we want to keep Patagonia in the loop. Should I just reach out to my usual Patagonia contact? For all major updates, please reach out to the Patagonia Grants Team at grants@patagonia.com. This is our new grants email account, which will ensure quicker and more effective communications. Thank you! As a general rule of thumb, please reach out to our CyberGrants Support Team at cgsupport@cybergrants.com for all questions related to the application process, updating your organization’s information and receiving notifications. Please reach out to our Patagonia Grants Team at grants@patagonia.com for all other questions related to grants decisions and major proposal/project updates. Thank you!